Blackstone Exclusive - Stefan Rudnicki interviews Orson Scott Card about Card's latest nove, THE LOST GATE. 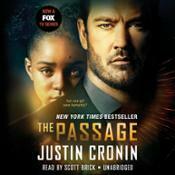 The audiobook was relased earlier this month! You can read the entire interview at Blackstone's site. Blood and Honor: The Forest Kingdom Saga, Parts 1 & 2 of Book 2. by Simon R. Green. Multicast performance, adaptation 10 hours) GraphicAudio, 2010. A guest review by Sarah Trowbridge. The Boy With the Cuckoo-Clock Heart, by Mathias Malzieu, read by Jim Dale. Unabridged (5 hrs) Blackstone Audio, 2010. 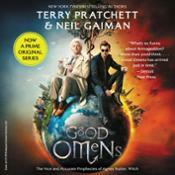 Good Omens, by Neil Gaiman and Terry Pratchett. REad by Martin Jarvis. Unabridged (12.5 hrs) Harper Audio, 2009. Reviewed in Books for Ears. READ REVIEW. The world is preparing to come to an end according to the Divine Plan recorded in the Nice and Accurate Prophecies of Agnes Nutter, Witch (recorded 1655). Meanwhile, a fussy angel and a fast-living demon have grown fond of living among the earth's mortals for many millennia and are not looking forward to the apocalypse.